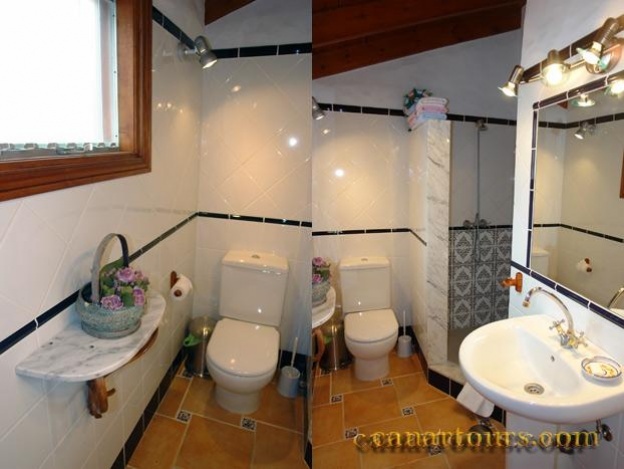 The house "Pepone" is located on the property of Finca "Fernandel" with the cottage Camillo. These were in the years 2001 to 2004 complete technically recently updated The charm of the old country house by the loving renovation is preserved. There is something special, here to stay or leave, because there are not many houses of this type Take advantage of the superior location, only 90 m above the sea, not far away and you can enjoy the fantastic views of the Atlantic.. All who love to rest will be interested that the mass tourism not be found. The owners family which operates a large banana plantation, lives about 300 meters away and will be happy giving advice and help. the banana cultivation and learn more about the country and its people. Of course, there is also a washing machine. The two houses (Casa Camillo and Casa Pepone) were built together, but have its own entrances and view-hedged terraces. The entire residential area is about 80 square meters. In every house there is a washing machine. Living room: high wooden ceilings, including satellite TV antenna for reception of international programs (also German). Kitchen a breakfast bar serves as a room divider. Cooking, all utensils including tea towels. A high chair for children is available. Bathroom: shower, sink, Toallete. Towels and bath towels are plentiful. 2 bedrooms: one with a double bed (2 mattresses each 90x190 cm), the other with two single beds (80x190), which can be pushed together. For the very young cots are available, linen is plentiful. Pool is about 200 m and offers sun terraces for communal use. Price: The rate per day for 1 to 2 persons € 75 for 3 to 4 persons € 90. Final cleaning coast one day rent. In the green northwest of the island is the county town of "Icod de los Vinos "
Icod de los Vinos is a community noth-northwest of the Canary islanf of Teneriffa with 24290 inhabitants (stand 2005). It is connected with Santa Cruz de Tenerife via the road Buenavista del Norte - Icod de los Vinos and TF-2. Icod de los Vinos is southwest of Santa Cruz de Tenerife and north of Arona and the airport Raina Sofia. Neighbour communities are La Guancha east, La Orotava southeast, Santiago del Teide south and Garachico west. Icos de los Vinos has an area of 95,9 qkm at an avarage 235m over sea level. In Icod de los Vinos stands the "Drago Milenario", the most well-known dragon-tree. Not long ago people assumed that it is around 3000 years old, but today they come to the realization that it is about 600 years old. On the opposite there is a worth seeing butterfly zoo where a iguana lives. Directly opposite is a very worth seeing Butterfly zoo, where also an iguana lives. very good for children. Deck chairs and umbrellas can be rented. A beach guard is watching the safety for your beach life. In addition, there are cafes, Restaurants, bars, supermarkets and pharmacies. The South Airport can be reached in about 1.5 hours, the North Airport in about 45 minutes. Restaurants and Supermarkets, banks, pharmacies, etc. are just 1 km away in the centre of Icod de los Vinos. On foot you can reach the sand beach of San Marco in about 15 minutes.